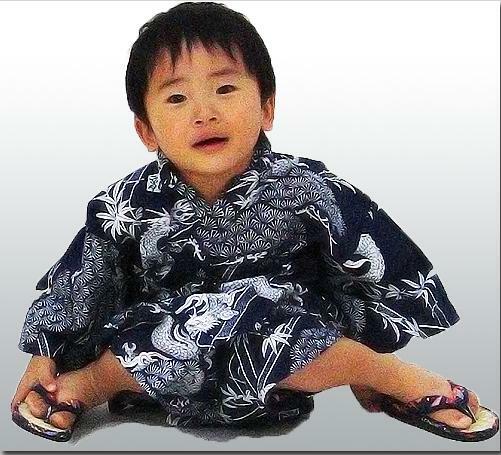 Kid's Jacket & Pants ( "JINBEI" ) --The dragon is flying between bamboo and pine trees. 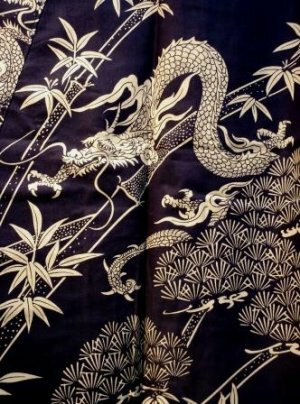 The dragon believed as the guardian creature that protects the God with his spiritual power is flying between the pine and the bamboo trees. It looks so cool !! "JINBEI"( jacket & short pants ) --- it is a very popular style in Japan and loved regardless of age widely by many people. Let's go out with it or relax for your comfortable sleep !! Suitable for casual attire. And it's comfortable and easy to wear while sleeping. With belt inside jacket for size adjustment. Easy-moving elasticized waistband. 100% cotton wicks away moisture. 100% cotton. Wash separately. Machine wash warm gentle. Do not bleach. Medium hot iron. Keep away from fire. Designed in Japan. Made in Thailand. SIZE :SS 13.7" 11.8" 5.5" 11.8"--18.8" 23.6" 2.3"
The dragon is flying between bamboo and pine trees. It looks very cool ! !